Going Google in Education: its hard not to use hyperbolic statements when describing Google Apps for Education. Its that good and its free! The diversity of apps you get with a Google account is astounding. I’ve felt for years that Google is an education company and they don’t even know it. 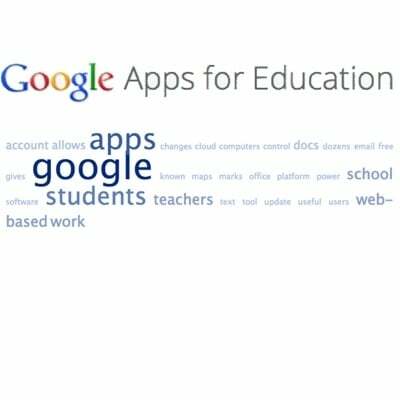 After hearing that institutions like Notre Dame University and Chicago Public Schools have adopted Google Apps I think they are starting to catch on, especially considering the latter is estimated to save 6 million dollars by moving to Google Apps. Our small school saves thousands annually on servers and email platforms alone. Each of our students and teachers has a managed account that has access to dozens of incredible, reliable apps that can be utilized in every subject. Gmail, Drive/Docs, Calendar, Sites, YouTube, Reader, and Blogger are just a few of the amazing apps your students will enjoy, but the hidden beauty of Google Apps is the sharing, security, and web-based platform. The days of “turning in” are obsolete when students can simply “share” their work with their teacher, and it totally changes the landscape of writing. I previously blogged about the power of writing in Google Docs. Inserting comments allows students and teachers to have a virtual conversation without marking up student work and gives teachers the power of real-time formative assessment. As a Google Apps school, you control and own your data, while letting Google handle storage and server maintenance. Google is totally web-based, so students can log in at school then go home on their own computer, log in to Google and pick up their work right where they left off. Their work saves automatically into the “cloud” and the revision history will allow them (and you) to review and/or revert to any previous version of their work. They have the same power on their phone or tablet anywhere, anytime. With Google Apps there is no need to install, maintain, or update new software--its all in the cloud! This is a dream for anyone who has had to update hundreds or thousands of computers in a district. In addition, Google is excellent about introducing new updates with pop-up bubbles explaining the changes in a user-friendly manner. Our district has chosen to move away from costly office software for student computers. Google Documents, Presentations, and Spreadsheets are excellent office substitutes that offer exceptional functionality and a growing number of special features. I have heard some teachers suggest that students need to learn Microsoft Office software, but the Microsoft platform changes with every new edition and its more important that students learn to adapt to new platforms and broaden their skill base beyond the confines of one product. Your Google Apps administrator has complete control of what apps are available to students and teachers. Each app can simply be switched on or off with a single click for individual users depending on the setup of the accounts. There are dozens of outstanding lesser known apps that are engaging and useful. Google Forms are part of the Drive/Docs App, but they deserve a special mention because Forms have incredible utility. Basically it is a survey tool, but it can also be used for quizzes, polling, purchasing requests, service request, etc. The data entered into the quiz or service request is populated in a Google Spreadsheet. You can even set up email notifications to alert you to a new submission or use a “script” to grade a quiz. Google Moderator is hardly known, even to Google gurus. This app allows users to submit and vote on questions about a lecture, video, or any event. Basically its a Google-based backchannel for discussion. Its similar to the web tool gosoapbox, which is great, but anonymous. Sometimes anonymity allows for abuse in digital discussion forums. Google Voice gives users (probably best just for teachers) a free phone number that they can use to communicate with students and parents without giving out their personal information. You can call, text, and receive email notifications every time you receive a call or text. Google+ is an emerging social network that may rival Facebook in the future. You can set up a controlled network within a school similar to an Edmodo environment. Another great features is the Hangout. Hangouts are one of the best ways to organize a video chat with up to nine other people! Google Maps is well known, but many don’t know it is slowly becoming a web-based version of Google Earth. Google Earth is amazing, but its extra software that must be installed and maintained. You can create custom maps in Google Maps with your own place marks, shapes, and colors and everything is saved in the cloud. Students can insert images and text into the place marks and give a virtual tour of anything that can be found on a map--a great activity for social studies and English classrooms. I could go on about the dozens of other apps and their potential uses in class because there are so many, they are so useful, and they are all free. I sometimes feel like an unpaid sales associate for Google. The web-based platform of Google provides anywhere/anytime access, which reflects the edtech landscape that is clearly moving to web-based applications, so when you go Google, you will be ahead of the curve. It can be argued that the glory of Google completely depends on an Internet connection, but the time of ubiquitous WiFi is approaching. Poverty greatly affects our community and our students rarely have trouble finding a connection. Oh, did I mention that Google Drive/Docs allows off-line editing? As a Google user and overall tech-evangelist I can easily say Google Apps is the most powerful tech tool available for the classroom and one I couldn’t go without.